(by “a couple weeks” I am referring to in-comic timeframes. Next strip is still Wednesday as usual). -EDIT- Also, it came to my attention that the ComicMix March Madness Webcomics Tournament has started again. If you could nominate/vote for Selkie (as well as your other favorite webcomics of course), I’d much appreciate the help getting the word out. The original ending to this arc was very different in tone in all the wrong ways and I'm glad I revised it. In the original draft, Mary left the apartment building to get her car brought around, and found a note on the windshield, "You're not very good at keeping secrets." signed with a capital B.
I feel like that ending would have been ominous in all the wrong ways, and more than a little cliched. Not that I'm beyond cliches, mind you. ;P This revised version works a lot better for me. So… they’re basically using the orphanage as a place to slowly integrate fish-people children into society, allowing humans to become accustomed to seeing them and allowing for their differences before the fish-people society can be revealed to avoid knee-jerk violent reactions against a new, unknown factor? ……Spoilers!!!! you need to warn people when you have a deep thought like that!! They’re only spoilers if they’re true. At this point, it’s just conjecture. That suggests a much stranger motive behind Selkie’s abandonment. And makes you wonder…was it coerced? If I’m close to the mark, that kind of puts page 242 in a new light, doesn’t it? Especially if maybe only a few of the Fish-people are interacting with humans, most probably don’t speak English (and/or other human language). Which might put Selkie’s mom in a medium-high to very high position in their version of the state department, as an ambassador to the humans. Maybe Selkie’s mom drew the short straw and had to send her daughter to integrate with humans. Following this train of thought, Selkie would be the daughter of a Very Important Person, and almost an ambassador in her own right. Not that she would know it–that would defeat the purpose of integrating her into human society. And if/when Selkie’s mom is expecting to get her back… that “diplomatic incident” is going to cause someone a LOT of paperwork. Unless I’m completely wrong, of course. That’s always a very big possibility. I have to think that if integration efforts are at such an early point, the government must be putting extraordinary pressure on the media to prevent them from following that doctor around. It has been said that “a society will be judged on the basis of how it treats its weakest members.” Can you think of a better way to gauge our humanity than to watch us care for an orphaned child? That´s awfully rough on the orphaned child, if you judged them wrong. It certainly is rough, but far worse things happen in this world on an hourly basis. Whatever the case, “guppies” is clearly being used in a derogatory fashion. Frankly, I think that nobody takes a child to an orphanage, especially one from another species, unless there is something seriously WRONG. I suspect that her mother may not ever be back, as in she was dying. The agents comment of “guppies” suggests a slight note of contempt. I wonder if the agent doesn’t relish this work. I raised guppies, I wonder if that is an offhand comment on the way they breed or just that its a generic for a cheap pet fish. Not using her real name may have been a way to protect her. Nei Li may be a pet name, too, like snowflake or something, or maybe its not until Selkie trusts her new Dad that she will correct his name for her. I think the adoption is permanent, regardless of if the Mother is still alive or not. But they may move next to the lake once a big reveal occurs. Interesting episode. Plo Quar said “Just a while”, and “I won’t be long” — and it seems cruel for her to give false hope to her daughter. I think she was expecting to return, but something went wrong. Sounds to me like he’s talking in code, or at least using a typical code for his organization. Can I just say how much I appreciate it that you update when you say you will. Thank you very much. Come on people let’s get some more votes out there! We need to move Selkie up in the ranks. This seems like as good a time as any to mention a theory of mine. 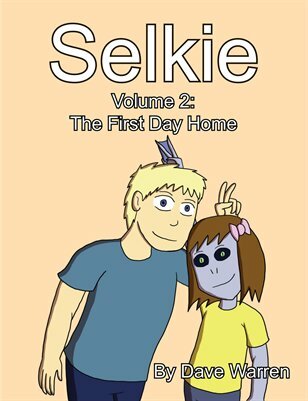 Selkie’s adoption into the human world was a social experiment, to see how safe it would be for the existence of her species/race to become public knowledge. I question the ethics of dumping a child alone into a completely foreign environment for any purpose, let alone experimentation, but it is understandable that a child would be selected, since they would be seen as less of a threat capable of disrupting society at its base (by those inclined to see anything “alien” as threatening) than an adult or larger group would be. And the older Fish-Man we saw in the hospital scene? Same experiment, earlier generation. You have to have multiple, replicable results for an experiment to be statistically significant enough to make decisions based on it that could affect culture so drastically. Oh. It’s already being discussed. Guess I need to start reading comments before posting my own. On the Guppies… it could be code… or it could just be a way to get the readers to think “more like Selkie”. I mean, that was my gut-reaction, was that he meant more like Selkie, but didn’t know what to call them. And I think of guppy as “little fish” which easily translates into “young fish” for connotation. Or, that might actually be what they call their own young. I think if he didn’t like this aspect of his job, he wouldn’t be playing Go with the lady in charge of the orphanage (forget her name x.x). Then again, there aren’t many Americans who know how to play Go, so he might just be partnering with her out of lack of better partners… It would be interesting to know if he was picked for the job, or if he volunteered for it. Yes, it did seem like Selkie’s mother didn’t really want to send her away. But wasn’t there a comic in which we saw a human girl getting adopted by a fish-people family? Maybe it was an exchange program? And the point is for the kid to then relearn their old culture and be a suitable ambassador for the introduction? We don’t know much about how Selkie’s kind breeds. So far as we can tell, they age like humans once born, but maybe they had a few years advance warning about an influx of orphans, if they lay eggs that take awhile to hatch? Also, I vaguely remember people from the sea supposedly supposed to have something to do with the apocalypse. WAIT! What I mean is- if they know about this rumor, they’d want to make sure that the knowledge about this species is introduced as gradually and non-threateningly as possible. Ah, so many theories, I can’t wait to see what Dave has in store for us! Looking at the moves those two are making, I’m not so convinced that they actually know how to play go. The human girl up for adoption was ‘Sophie’, a version of Selkie in an alternate universe in which, presumably, humans were the species in hiding. Links to the comics in question. Thank you, I forgot to reply to this. Yes, the “human raised by fish people” was actually an April Fools strip where I flipped the character’s species. If “guppies” is code, or possibly slang, for the young of this species, the “feeding the guppies” comment could also refer to Selkie’s food “allergies”. Since this orphanage already raised Selkie for three years or so (age five to age eight, right? ), they wouldn’t have to go through the process of working out the diet through trial and error again if more carnivorous amphibian kids showed up. His comment at the end is a somewhat perplexing. Is he referring to Selkie? The media? Society at large? I have no idea. That said, he doesn’t seem like a bad sort, and it really does seem like the government is trying its damnedest to help the situation, instead of just shooting everything that isn’t human. A nice change from the standard Hollywood approach, I’ll say. A question for our Mr. Warren. What’s the active temperature range for Selkie’s species? We know she’s poikilothermic, and doesn’t handle the cold well. But if they have taken up residence in Lake Superior, well, it’s a cold lake, especially in the winter. How do they tolerate it? In less advanced times they hibernated when the temperature got too cold, but the modern-day members of the species circumvent hibernation states with technology. Technology which is not within Selkie’s grasp, but she also has access to enough ambient temperature control of human origin that she gets along. I only have one question, why is Selkie’s case been handled by the CIA? The CIA isn’t supposed to operate in America they can only operate on foreign soil. Well legally. Shouldn’t the FBI be handling her case? I’ll confess that my understanding of their jurisdictions comes from Wikipedia, so I might be doing it wrong, but it’s my understanding that the CIA handles intelligence gathering and dissemination while the FBI is a law-enforcement entity. So a scenario of non-human sentient lifeforms would fall under a more “gather information” area than anything that requires investigation or arrest. I know I said something about that before, but it’s easily justified by saying the CIA is handling because it’s a foreign previously unknown nation. The CIA would be involved instead if the State department to keep it quiet, probably with some high-clearance State people to handle actual diplomatic interactions. I think it unlikely that the FBI and CIA have such clear-cut areas of jurisdiction in the practical world. “There more guidelines than actual rules.” They probably overlap, and they probably squabble over who is allowed to do what, and they probably hide things from each other. It’s erroneous to assume that your government is one big team. Maybe later, an FBI agent could get involved, and prove to be nastier than Mr Brown. He could challenge Mr Brown’s right to be in charge of this case, for the very same reasons that people have been bringing up. By technicality, governments favorite kind, yes this would fall into the CIA area because even if living in the US physically they are not US citizens. Thus an outside group. Should be someone from the diplomatic branch though. May have been subbed out to the CIA because of the experience with “infiltration”. I voted for you! Right now you have 43 votes, which upsets me. The CIA takes tropical freshwater aquariums VERY seriously. Just discovered this comic and LOVE IT! This particular episode, well, a little dark helps offset the light, right?